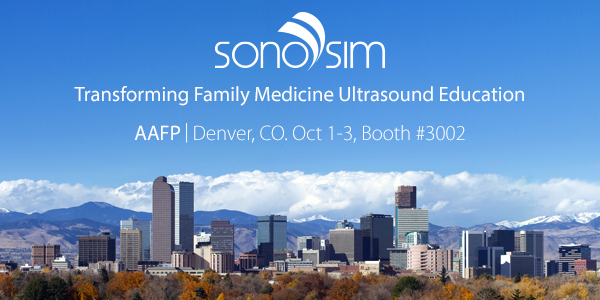 Join us at AAFP Booth #3002 and see firsthand how the SonoSim® Ultrasound Training Solution can be used to integrate point-of-care ultrasound into your clinical skill set. Family medicine clinicians are increasingly utilizing bedside ultrasound to evaluate various deep organs, as well as superficial anatomical structures. Bedside ultrasonography is a relatively inexpensive, safe, and noninvasive diagnostic tool with many medical indications. The SonoSim® Ultrasound Training Solution is a portable, virtual ultrasound training experience, utilizing real patient cases with a broad spectrum of normal and pathologic conditions. Use the SonoSimulator® to scan a myriad of normal and abnormal sonographic conditions and experience first-hand how SonoSim LiveScan™ seamlessly recreates ultrasound pathology in healthy living volunteers and patient simulators. NEW modules at AAFP Booth #3002.